Nestled in the west of the island, between Playa de la Arena and Los Gigantes, Puerto de Santiago is small fishing village which is slowly developing into an up-and-coming tourist resort. In Puerto de Santiago, holidays are focused on sunbathing and taking it easy, with most of the action centred on the hotels. If you can’t go a week or two without partying, Playa de Las Americas – with its buzzing clubs, numerous bars and cheap booze – is only a 20-minute drive away. The area needs a fair bit of work before it will feature on the front of travel brochures, but this lends to its charm and Canarian-feel. Whereas its neighbours boast lively centres lined with cafes, bars and restaurants, Puerto de Santiago features only a handful of eateries tucked away in backstreets, almost like they’re in hiding. The hide-and-seek theme continues with the beach and small harbour which are also hard to find, concealed behind more winding streets. Because Puerto de Santiago has yet to take up its place as a fully-fledged tourist resort, the prices at the local eateries are sure to bring a smile to your face. Restaurante Azafran is no exception and serves a variety of Mediterranean and Spanish delicacies which always please the palate. If you’re craving some British company, you’ll be happy to hear that the resort does sport a small number of British bars, including the welcoming Outside Inn and Beeches Brook where you can catch up on all the latest sporting events. Effort is being made to improve the resort, with the addition of a brand new coastal walk linking the harbour and Los Gigantes and is without a doubt one of the highlights of the area. If you have a couple of hours spare, take your time and enjoy a stroll along the promenade, stopping at the benches along the way to appreciate the incredible sea views. With the giant skeleton of a whale in Los Silos and a stone fountain full of flamboyantly-dressed bathers in Costa de Silencio, Tenerife isn’t a stranger to unusual and bizarre pieces of art. 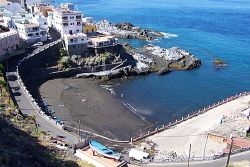 Puerto de Santiago is the home of another strange exhibit – the fishing museum. Well, not the fishing museum itself, but the front of the building. Imagine a giant 3D picture-book, complete with fisherman, sailing boats, and lifelike fish.